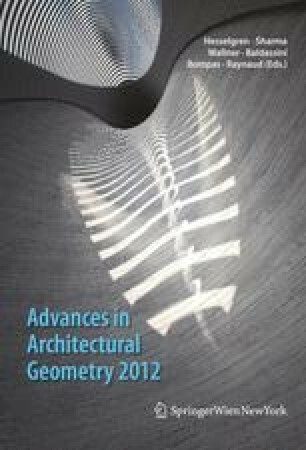 Much of the discourse in architectural geometry has focused on the geometric design and physical optimisation of the material ‘Building Model’, specifically the building structure and envelope, and the digital fabrication of facades. In this paper we want to “go behind the façade’ and consider architecture not so much as a physical building model, but at a more abstract level, as the ‘enclosure of space’. The intent is to explore related geometric and topological concepts which can be the foundation of appropriate computational design tools. The objective of these tools is to support the design of a ‘spatial’ architecture and the use of the spatial analysis of building models in related engineering design processes. To achieve this we are using the concept of nonmanifold topology implemented in ASM (the Autodesk Shape Manager), but in a novel way. In this approach the interior of what would normally be referred to as a ‘solid body’ is not thought of as being composed of solid material, but rather as an enclosed void that can be used in an architectural sense to represent the ‘enclosure of space’.